How To Start Seeds Outside In The Snow And Freezing Cold! …winter can easily become a time of twiddling your thumbs while you wait for it to warm back up outside. But what if I told you that you can start the seeds for your summer garden outside during the winter – even when SNOW is on the ground!? You may think I sound crazy…but let me introduce you to winter sowing. It is very easy, very inexpensive, and lots of fun! With the winter sowing method, you don’t have to buy any expensive equipment, everything you need you’ll find in your recycling bin! You don’t need to worry about finding space indoors for all those seed flats, or setting up cumbersome lighting in your basement or spare bedroom – the seed flats go outside! Plus you can start your seeds much earlier, and get a jump on sowing your seeds well before you can start seeds indoors! Start your seeds outside in the snow and freezing cold! I’ve been winter sowing seeds for several years now, and have worked through all the trials and errors so that you don’t have to! 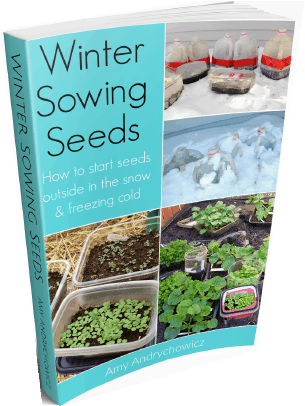 This eBook is jam-packed full of information and tips to show you exactly how to winter sow your seeds. So, if you’re tired of fussing with all that seed starting equipment you need to grow seeds indoors, you don’t have any room in your house to start seeds, or you simply want to experiment with a new method for growing seeds, then this eBook is for you! This step-by-step guide will give you all the details you need to start winter sowing seeds, and grow strong, healthy seedlings without all the fuss! For less than the cost of a few packets of seeds, you’ll be winter sowing in no time. Get started winter sowing today!